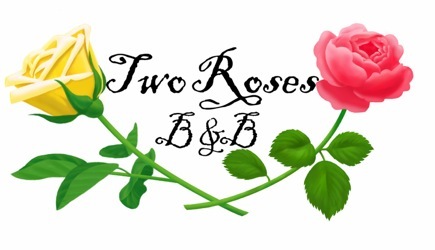 Two Roses B&B. 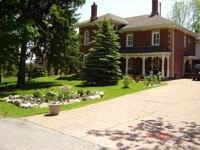 An Elegant Century Mansion situated in the heart of the picturesque town of St. George, Ontario Canada. Prominently situated on an elevated ½ acre estate with complete privacy and a commanding view from all vantage points. Grand ceilings, antique décor, and the striking details of Victorian architecture give our B&B an inviting, cozy charm. 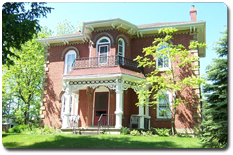 One of the oldest homes in the area, Two Roses B&B is a St. George heritage landmark built in 1880. Situated in a quiet village setting, yet close to all amenities, the arena and the library are all within walking distance. 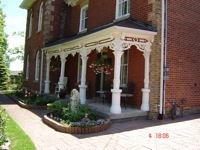 Located halfway between Brantford and Cambridge, Two Roses B&B is truly the place to stay and relax. History-In early 1878 Mr. Thompson, then a well known and successful business man in the area, purchased the land where the existing house sits, from the local inhabitants, and set out to build the house, taking two years to complete the original structure. In 1880 it was sold to Mr. William Bruce Wood, who lived in the house until the early 1900s. A local businessman and owner of the creamery in St. George purchased the property, occupying in it till the 1940’s. 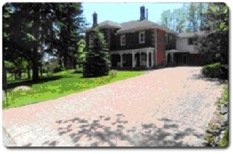 The house was then sold to the Nesbit family who lived in the house till late 1999. James Didmon restored the William B. Wood house in 1907 and opened a butcher shop in an detached building to the West of the house. 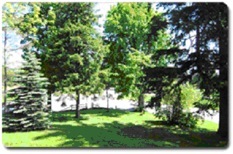 Fabulous fenced, totally private backyard, large deck and lots of parking.